The Iron Horse races are held in conjunction with the annual Katy Days Festival every Memorial Day weekend. Come join us in celebrating railroad heritage and enjoy 3 days of entertainment, food, fun and railroad activities. Check out the Katy Days festival website for a full list of events and times: http://www.katydays.com. 2. 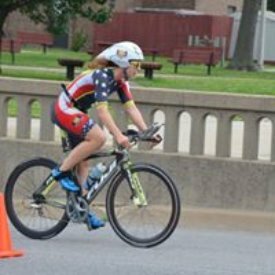 Duathlon (Team or Individual) This race starts with a 5K, then 20 mile bike ride to Dennis, KS and back, then finish with another 5K on the same route. If participating as a team, one person is the runner and the other is the biker. 3. 1K - This is a Fun Run/Walk for all ages. Race day registration is available Saturday morning starting at 6:30 am at the race site. Chip timing will be provided by TwelveOne race management group. Pre-register by Monday, May 14th for SHIRT GUARANTEE! The entire course is flat. Both the run and bike routes are open to traffic, however, Parsons Police and race volunteers will be stationed throughout course turns and intersections. All participants should be observant and careful. All bike participants are required to wear a helmet. Plaques are given to the 1st place Male and Female of the 5K and Duathlon (both individual and team). Custom medals are awarded to the top 3 male and female finishers in each age category. 1K participants will receive a Finisher's Medal. Pre-registered participants receive a "Goodie Bag" with various items from sponsors as well as water and snacks at the finish line. Music and DJ will be provided by TwelveOne race management. There will be music at the race site to keep you motivated and entertained. Back by popular demand, Friday night at Forest Park (13th and Broadway) at the Katy Days festival, there will be a booth set up from 4:30-5:30 pm for all events. You may pick up your packet containing your bib, shirt and race info. Race results will be posted on the Katy Days and twelveone website after the race. Results will also be printed in the local Parsons Sun newspaper. LIKE OUR FACEBOOK PAGE to receive IMPORTANT race announcements, updates, notifications, and race day pictures. Proceeds from the race are donated to the Katy Days festival. Sponsors are Bleacher Gear, Bank of Parsons, and Labette Health.